A timed auction devoted to the sport of polo, which is celebrating the 150th anniversary of the first polo game played in England this year, starts next month. From photographs of famous faces such as HM The Queen and Prince Charles to Winston Churchill playing in a match on behalf of the House of Commons through to illustrations by E.H. Shepard (of Winnie-the-Pooh fame) and even rare books from a Walt Disney Cartoon of 1936 titled Mickey’s Polo Team, the sale includes a wide range of items – all with links to, or depicting Polo. The auction comprises more than 200 lots. Many of the items are from the collections of Nigel A’Brassard – a well known figure, historian and player within the Polo world and Iain Brunt, who worked for one of the greatest art dealers in the world in the 20th century and helped form many private art collections. He also worked with Les Diables Bleus who have won many tournaments globally – with their most famous player being HRH Prince Charles, Prince of Wales and now owns and runs one of Europe’s largest antiques and art internet sites. 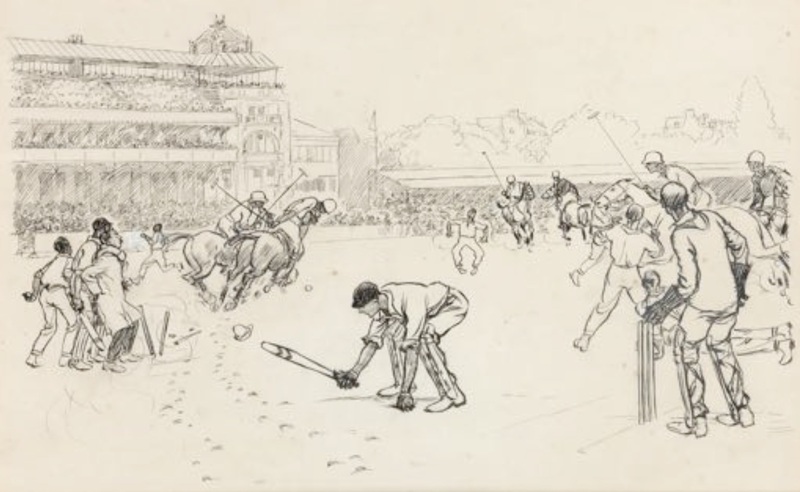 Among the highlights of the sale is a an original pen & ink cartoon by Ernest Howard Shepard (1879-1976) for Punch magazine in 1921 featuring a scene humorously suggesting that the Ashes cricket Test Match at Lord’s and the Westchester Cup polo match at Hurlingham might be played simultaneously for the convenience of American visitors to the London sporting summer season. E.H. Shepard is most famous for his anthropomorphic animal characters in A. A. Milne’s Winnie-the-Pooh and Kenneth Grahame’s The Wind In The Willows. The cartoon is expected to fetch £800-1,200. A set of four original black and white press photographs featuring the Royal Family and polo are also to be included, among them: Edward, Prince of Wales (later King Edward VIII, the Duke of Windsor), 1924; HM The Queen and Princess Anne at Smith’s Lawn, Windsor, 1955 and Prince Charles receiving his first polo lesson at Windsor aged 13 in 1962 – they are estimated at £120-180. A limited edition facsimile letter from Winston Churchill to Sir Algernon West, dating from 18th February 1898 of polo interest will be sold together with an original black and white photograph portraying Winston Churchill dressed for polo in the kit of the House of Commons team at Ranelagh on 18th July 1925, which is expected to fetch £150-200. A scarce children’s book in French, Mickey Hop-La! Une Partie de Polo, with three pop-up illustrations is estimated at £600-800. Mickey’s Polo Team was a short animated film produced by Walt Disney in 1936. The cartoon features a game of polo played between four Disney characters, led by Mickey Mouse with Goofy, Big Bad Wolf & Donald Duck; and four cartoon versions of real-life movie stars Stan Laurel, Oliver Hardy, Harpo Marx & Charlie Chaplin. The film was inspired by Walt Disney’s personal love of the game of polo, however a fall in a polo match left him with four shattered vertebrae that would prove a health issue for the rest of his life. Also of note is an important early international polo tournament gold winner’s medal awarded by the Argentine Polo Association for the River Plate Open Championship played at Hurlingham in 1907 and won by Western Polo Club, which is estimated at £1,000-1,500. This medal has thrown up several questions about the results of an important Polo match in Argentina at the start of the 20th century. As engraved on the 1907 medal the tournament was won by the team from Western Polo Club made up of John Argentine Campbell, Richard Leared, Henry Howard Drysdale and Stanley Mallet. For some reason the Argentine Association of Polo records and apparently the engraving on the trophy itself show the team as Western Camps and with the name of Eduardo Lucero rather than Mallet as the fourth member of the team. Western Polo Club beat Gee- Bungs by 8 goals to 3, to win the championship. The current vendor contacted Dr. Horace Laffaye, the world’s preeminent polo historian, and asked if he could throw any light on this discrepancy. Within days, Horace had checked the newspaper The Standard of 16th September 1907 and discovered that it was Stanley Mallet that had played as the No. 3 of Western and had scored four goals. So a mystery has been solved and the name of Stanley Mallet is added to the list of those players that have won the Argentine Open – the world’s most prestigious polo tournament. An original JAK [Raymond Jackson, 1927-1997] cartoon artwork featuring a humorous scene in the bar of the Guards Polo Club, signed JAK, titled NOT ANOTHER ABUSE OF THE STICK OLD BOY?. Jak was one of the bestknown British newspaper cartoonists who mostly worked for the London Evening Standard and this cartoon is estimated at £100- 150, with proceeds donated to the Polo Pastures charity. A photogravure commemorating Cirencester Polo Club’s victory in the County Cup season 1911 carries an estimate of £200-300. A painting of the 1974 Gold Cup Final at Cowdray won by Lord Vestey’s Stowell Park team, estimated at £250, with proceeds donated to St Wilfrid’s Hospice. A watercolour by Carruthers of the 1936 Westchester Cup, estimated at £500-700, with proceeds donated to the American International Polo Federation. The first book published on the game of polo: Captain George John Younghusband’s Polo in India, which carries an estimate of £300-400. Proceeds will go to the Polo Charity.